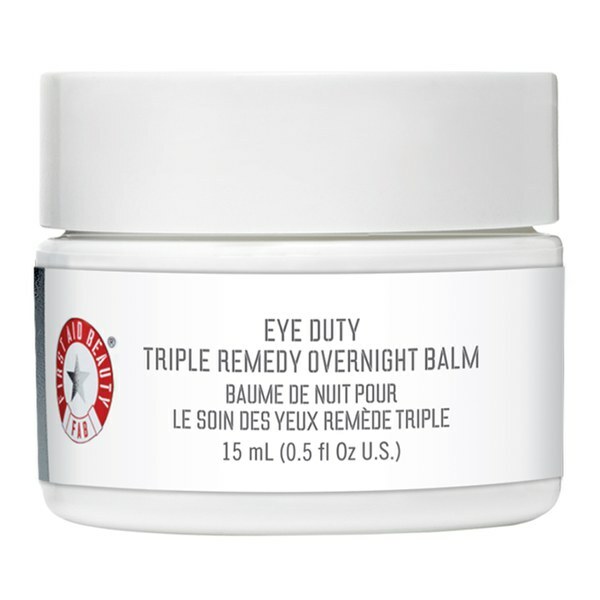 Perfect for those longing for 360° nightly eye treatment, the First Aid Beauty Eye Duty Triple Remedy Overnight Balm is an anti-ageing eye treatment that works with your skin during its natural overnight regeneration process to firm, smooth and hydrate the orbital eye area (both the upper lid and undereye). Formulated with a powerful peptide blend to smooth away fine lines and wrinkles, its rich texture gradually absorbs into the skin whilst you sleep, delivering a healthy dose of moisture to visibly firm and tone sagging eyelids whilst brightening dark circles. Its blend of niacinamide and spilanthes acmella flower work to improve elasticity, whilst hydrating butters and waxes deeply nourish, soften and condition for a more youthful, wide awake appearance. Designed to work on the entire orbital eye area, both above and below, and specifically for overnight use to achieve maximum efficacy. - K.N. Apply generously to the entire eye area, including the upper eyelid. Aqua/Water/Eau, Glycerin, Butyrospermum Parkii (Shea) Butter, Caprylic/Capric Triglyceride, Dimethicone, C10-18 Triglycerides, Ethylhexyl Palmitate, Cetyl Alcohol, Aluminum Starch Octenylsuccinate, Glyceryl Stearate, Niacinamide, Chrysanthemum Parthenium (Feverfew) Extract, Spilanthes Acmella Flower Extract, Acacia Decurrens Flower Wax, Camellia Sinensis Leaf Extract, Glycyrrhiza Glabra (Licorice) Root Extract, Jojoba Esters, Palmitoyl Hexapeptide-12, Palmitoyl Tetrapeptide-7, Algae Extract, Carbomer, Hyaluronic Acid, Helianthus Annuus (Sunflower) Seed Wax, PEG-75 Stearate, Caprylyl Glycol, Ceteth-20, Steareth-20, Acrylates/C10-30 Alkyl Acrylate Crosspolymer, Xanthan Gum, Butylene Glycol, Leuconostoc/Radish Root Ferment Filtrate, Polyglycerin-3, Sodium Lactate, Polysorbate 20, Palmitic Acid, Sodium Hydroxide, Tetrasodium EDTA, EDTA, Citric Acid, Phenoxyethanol.